As the leaves begin to turn bright shades of yellow, orange, and red, and the temperatures begin to dip into the 40s in the sleepy border towns of Sweet Grass, Mont., and Coutts, Alberta, folks prepare themselves for what they know is coming, a long, cold winter. People on both sides of the border are spending the weekend fixing roof tops, and weatherproofing wooden fences. Though the port of entry is one of the largest and busiest along the Montana/Alberta divide, the communities of Sweet Grass, Mont., and Coutts, Alberta, are far from busy or large. Sweet Grass has a mere population of 58, according to the latest U.S. Census data. 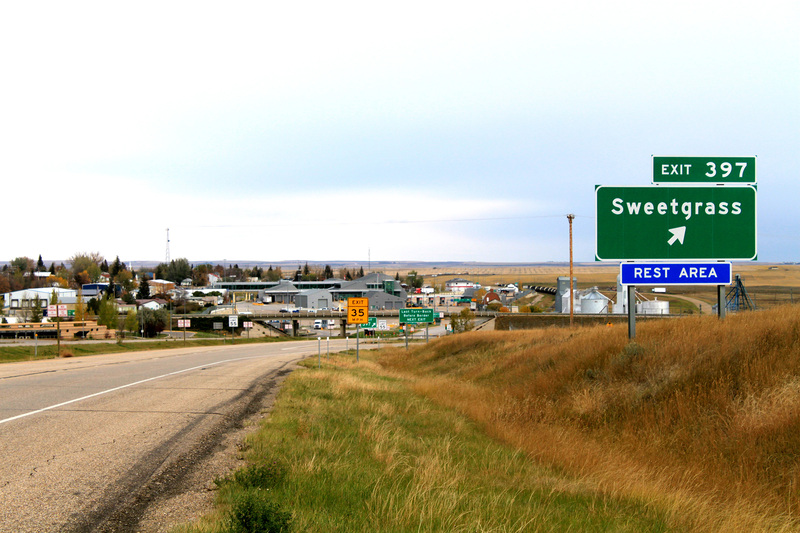 Just across the line, in town of Coutts, there is by no means a metropolis, but with almost 300 residents, it is almost six times the size of Sweetgrass. Laura Doutlas has lived in Sweet Grass for more than seven decades, and while she has sometimes left, she has always returned. “I’ve just always come back because it’s home I guess,” Doutlas said. Doutlas and others agree that the economic challenges in these two binational border communities are daunting. Yet, it’s the border itself that in some ways might be the key to the towns’ economic survival. Allan Underal, chair of the Toole County Commissioners said the border is the strongest factor that fuels the economy of Sweet Grass. The port of entry that Sweet Grass and Coutts share is the only 24-hour port of entry in Alberta, Canada. Every year, an average of 750,000 travelers (mostly vehicles) cross into Alberta, according to the Village of Coutts Economic Development Community Profile. Interstate 15 guides travelers, visitors and truckers north towards Sweet Grass, Mont. Photo by Amanda Oien. Customs brokers are one of the main businesses on both sides. Brokers are made up of private individuals, partnerships, associations or corporations that are licensed and regulated by U.S. Customs and Border Protection or the Canadian Border Services to help importers and exporters meet requirements regarding imports and exports. The brokerage houses were the reason for Sweet Grass. Plain and simple. That was to serve the border. Although more than 58 people might be working in Sweet Grass on a given day, the employees, whether they work with brokerages, border authorities, or businesses, like the well-known Glocca Morra Inn, many live in other surrounding communities. Underal said there isn’t a grocery store or other services in Sweet Grass, but that wasn’t always the case. “It used to have a few more businesses, but there’s just not enough action there to warrant a lot of those things,” Underal said. Brandon said Sweet Grass has lost a lot of its jobs to technology. Because of the loss of jobs, Underal and Brandon are concerned that brokerage jobs also could disappear from Sweetgrass. While jobs might be dwindling, both Underal and Brandon agreed that despite Sweet Grass’ economic insecurities, the town could not disappear. Long-time resident Doutlas is not so optimistic. “Everything died off, when highways go through a little town, it pretty much kills it,” Doutlas said. 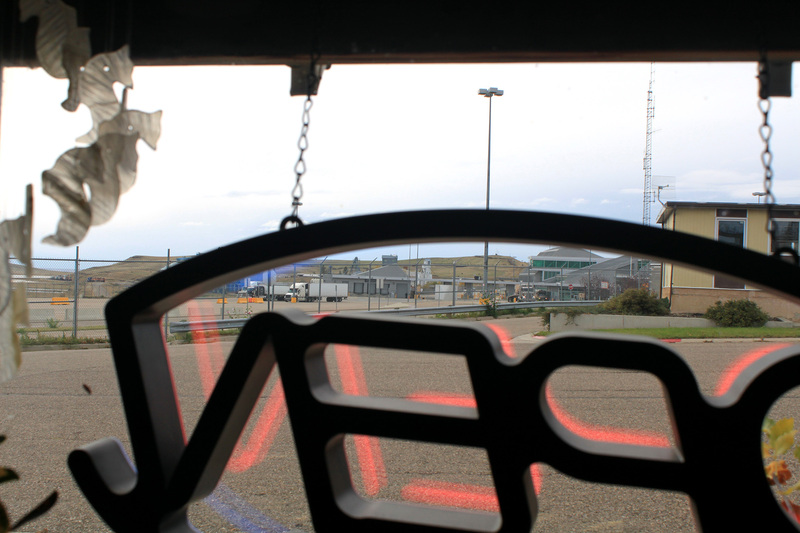 The oil refineries that once operated in Sweet Grass and the surrounding areas, brought businesses to the then five bars in Sweet Grass, according to Doutlas. Across the border, Lori Rolfe, chief administrative officer for the Village of Coutts, is the third generation resident of Coutts. Like in Sweet Grass, brokerages and a duty free store fuel the Coutts economy, but physical barriers deter travelers from visiting Coutts once crossing the border. In 2002, the port of entry became a combined building, accommodating both U.S. and Canadian customs offices. The Village of Coutts, left, in 1993 before the enhanced infrastructure of the port of entry in 2002. The photo on the right, taken in 2009, shows how the renovation of the port affected Coutts and cut out vital businesses. Residents speculate that the only reason the fence is there is to stop Canadians from shopping at the Duty Free store and turning around and going back home – not into the United States, as the law requires. If you just talk to people in general that you might meet somewhere that have been through this port, don’t realize there’s even a town here because you can’t see us anymore, really. Michelle Theissen, owner of the Kerv’s Korner Store, said after 9/11, Coutts began to see a steady decline in tourism once the fence was installed and the port became a joint building between the U.S. and Canada. The chain-link fence used to be accompanied by spiked barbed wire at the top. An open sign hangs in Michelle Theissen’s business, Kerv’s Korner Store, in Coutts, Alberta. Beyond the sign is the fence blocking visitors from Coutts and the port of entry. Photo by Amanda Oien. Aside from traffic being diverted away from Coutts as a result of the new port, Canadian federal policies seem to be indirectly hurting the Coutts economy. According to Rolfe, the Canadian government pays its officials to drive from Lethbridge, which is an hour north from Coutts. “They’ve deemed every community south of Lethbridge, to the border, as not suitable to live in because they have this whole list of what makes you suitable,” Rolfe said. One of the requirements, according to Rolfe, is having a pharmacy that is open at least six days a week. “There’s a pharmacy in Milk River, but it’s not open on the weekend,” Rolfe said. Rolfe described Milk River, which is 11 miles north, as Coutts’ downtown. It’s also where Coutts children must attend school. The village school closed in 2010 because of low enrollment. Neighborhood kids now go to school miles away, but they still frequent the historic school playground, which is overgrown with grass and dandelions. 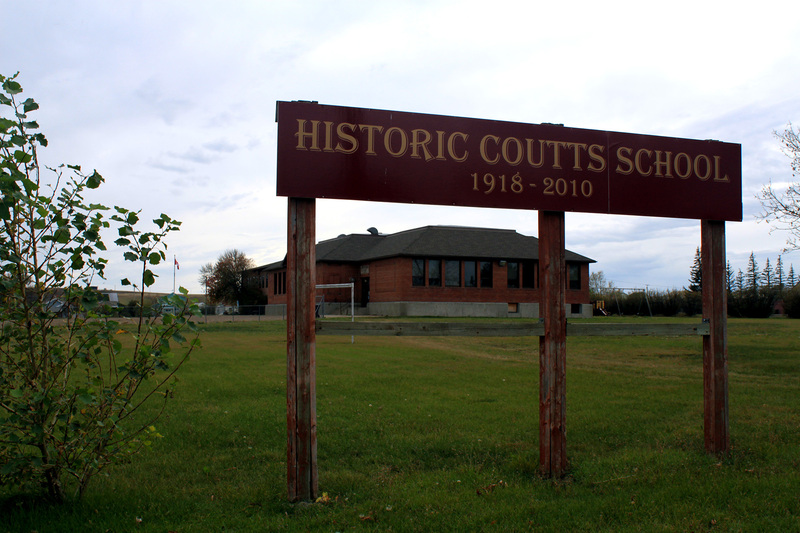 The Historic Coutts School in Coutts, Alberta, sits empty since it was forced to close in 2010 because of low enrollment. Photo by Amanda Oien. With so many difficulties facing Coutts, Rolfe finds it hard to imagine her town without the port of entry. “If the border wasn’t here, this town wouldn’t exist,” Rolfe said. At the southernmost part of the Canamex Corridor sits the border community of Ambos Nogales in Arizona and Sonora, Mexico. A rust-colored steel barrier divides the two cities. Photo by Amanda Oien. Economic insecurity is also present on the southern border as well, 1,524 miles south, along the 110th meridian, in the border community of Ambos Nogales. 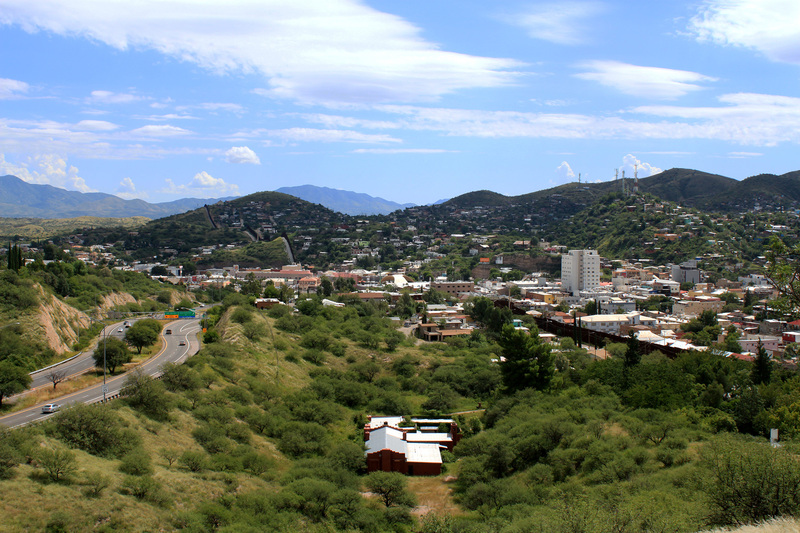 Nogales, Ariz., and Nogales, Sonora, what people call Ambos Nogales, have similarities as well as stark differences when compared with the border that’s 1500 miles north in Sweet Grass/ Coutts. The international boundary that divides Sweet Grass and Coutts looks like an open field. The border is marked with flimsy plastic orange stakes that easily bend when the wind picks up. By contrast, in Ambos Nogales, a rust-colored 20-foot steel fence delineates the border. The city has three ports of entry — one for pedestrians only, the main port for vehicles and pedestrians, and a growing commercial port that also allows pedestrian crossings. According to U.S. Census data in 2013, the population of Nogales, Ariz., was 20,456 which is significantly larger than even Sweet Grass and Coutts combined. Nogales, Sonora, just as Coutts, has a larger population than its U.S. counterpart with well over 212,000 residents in 2010, according to UN Data. Because Ambos Nogales also falls along the Canamex Corridor (a tri-national highway that links the U.S., Mexico and Canada), much of Ambos Nogales’ revenue comes from crossing goods and services, mostly notably produce from Mexico. By the end of the 2014-2015 season, the Fresh Produce Association of the Americas reported a total volume of 5.9 billion pounds of fresh produce traveling from Mexico, into the United States, which was then distributed throughout the country. 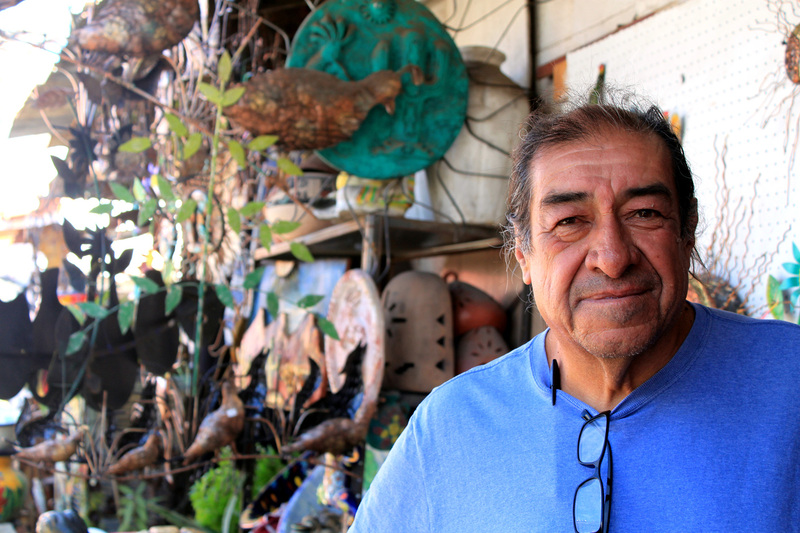 Jorge López Martínez, an employee at a shop in Nogales, Sonora, that has been around for nearly 60 years, said not many Americans are travelling into Nogales, Sonora because of the crime that is reported in the news, urging Americans to not cross the U.S./Mexico border. According to Martínez, because of the “power of money, bullets and guns,” business is very slow. “We can do nothing, but just tell them ‘Come over, enjoy yourself, thank you’, and that’s it,” Martínez said. While fighting the media’s interpretation of Nogales, Sonora, Martínez said he and his co-workers still wait for people to cross the border, hoping to make a few sales. Although Martínez said negative stereotypes and crime are affecting economic development in Nogales, Sonora, he said he would never move. Decorative rain chains hang in a shop in Nogales, Sonora. 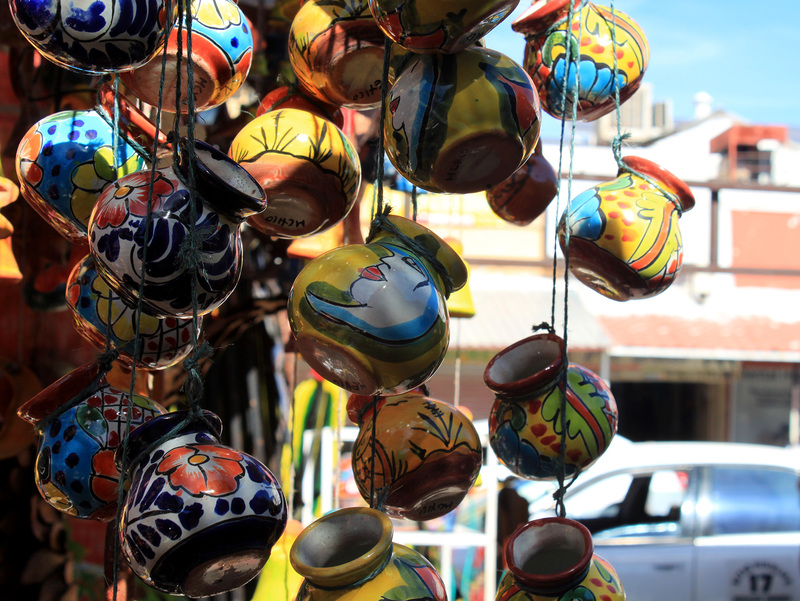 Employee, Jorge Lopez Martinez, works to sell items like these to travelers to make a living. Photo by Amanda Oien. While continuously fluctuating, the Mexican Peso is extremely weak compared to the U.S dollar. After the U.S. election, the peso dropped to about 20 pesos to the dollar. Shopkeepers are feeling the pinch. “It’s the power of money against the people who live in the town, trying to make a living,” Martínez said. On the U.S. side, shop owners and larger businesses rely on cross-national customers. And, with the peso down, they are bracing themselves for what could be a slow Christmas season. According to Urman, there are different sectors of business in Nogales, Ariz., that include reselling and whole-selling consumer products, the import of fresh produce from Mexico and the reestablished manufacturing sector in Nogales, Sonora, that provide employment on both sides of the border; such as warehouses and trucking companies. However, the local municipality survives off of sales tax, according to Urman. For Nogales, Ariz., it isn’t just small businesses closing that have negatively affected the local economy, like big box stores like K-Mart and Aeropostale closing. But strong bonds across the border might be the key to the binational community’s economic survival. Urman said Ambos Nogales has strong family and cultural ties with an engaged community between the two towns. “While we may see physical barriers, we don’t see community relationship barriers,” Urman said. Martha Estrella, an employee at a shop near the port of entry in Nogales, Ariz., also said the weak peso has been slowing down business. Estrella said business is so bad, she estimates the store’s profits are declining at 50 percent. The business that Estrella and the store she works at does receive is mostly from people from other towns who stop by, but she has also seen people who don’t stop at all and just continue to Tucson or to Phoenix. Whether in Ambos Nogales or more than 1,500 miles north, close to the 110th meridian, in Sweet Grass/Coutts, the border certainly divides, but the ports and cross border business are also helping to keep these communities alive.